What: The focus of NOAA's field study includes ESRL CSD airborne measurements using the NOAA WP-3D aircraft and the Twin Otter Remote Sensing aircraft, and surface measurements using the R/V Atlantis mobile platform as well as stationary ground sites. Who: Investigators in this project include researchers from several universities, industries, and governmental agencies. Participating institutions include Georgia Tech and University of Colorado CIRES. 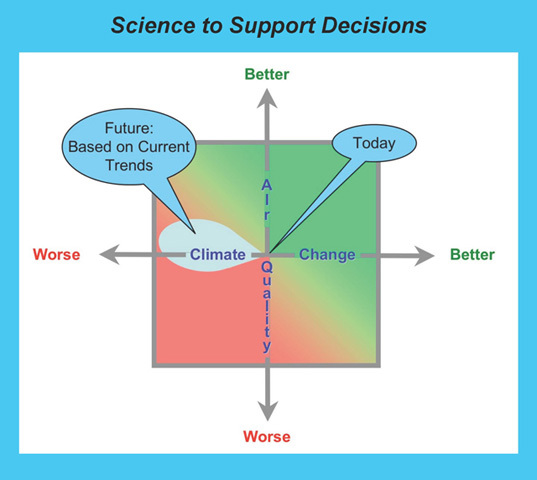 Schematic diagram of the trade-offs between the implications for regional air quality and global climate change of new policies for management of the atmosphere. The gray ellipse approximately represents the direction of current trends in the U.S.